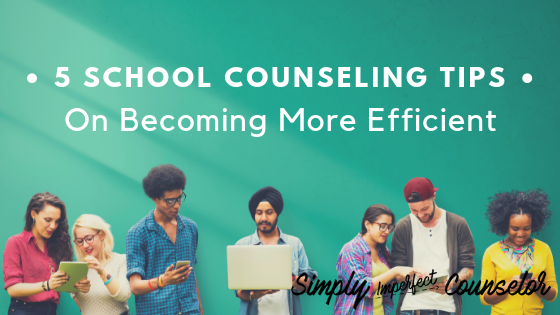 School counselors have many roles to fill when trying to meet the needs of students. It can be very easy to get sidetracked on less important tasks, and not even realize you’re doing it. This can cause you to feel behind and overwhelmed. In this article, you will find five tips to help you maximize your time and spend it where you need to. One of the biggest ways I have found to become more effective at what I do is to build relationships. The better relationship I have with people the better they understand where I’m coming from. For example, having great rapport with parents helps them connect and understand when you call them for something negative. The more I get to know parents and their struggles, the more I can be empathetic. With that kind of connection, it also lets me be as direct as I need to be, without losing their trust. This step also applies to teachers and students! One of the easiest ways to see if you’re being effective at what you’re doing is to look at the data. However, if you are always behind and overwhelmed, data can seem like a huge hassle and you might think “ain’t nobody got time for that”! What if I told you it doesn’t have to be extra work and you can build it right into your program? If you set something up ahead of time, it will be easier to do. For example, if you want to work out in the mornings but you’re not a morning person, laying out your workout clothes the night before makes it easier to get it done. So, if you are wanting pre and post data from certain lessons, go ahead and build that in. It can be a pre and post-test, an exit ticket, or as easy as thumbs up or thumbs down. This will get you the perception data that you’re looking for! If you are trying to find the effectiveness of a new initiative or program you are starting, build data collection into the early stages. What was the process and who was involved? This is where you explain how you went through the process of change. Explain the amount of kids and from what grade-levels (who was impacted). Also, think about what you did (the steps you took) and how often you did it. People can show you evidence or proof of impact. This data is the result on a bigger scale. This isn’t just the post-survey results. We have to think bigger here. What impact has it made for the long-term? People are able to demonstrate knowledge. How has it positively impacted students? One of the ways I built data into my day is to show where I am spending the majority of my time. The Simply Perfect Planner houses daily time task analysis so you can track your time right in your schedule. Another way to be effective is to manage your schedule wisely. When you have a solid schedule laid out it alleviates the need for you to get pulled in a million different directions. I know this happens and things come up, but referring back to your schedule allows you to advocate for what you need to be doing while setting healthy boundaries. First, create a calendar with all your school counseling duties for the day. List the classroom lessons you have, individual student times (no names), group times, school-wide activities, curriculum planning time, and build in time for responsive services or crisis support. This is just an outline for the month. Obviously, you might not stick 100% to this... I know I don’t, but at least you have a schedule of what you want to strive for and you can start setting up some healthy boundaries. Next step, is to share it with everyone! I like to send it to all the teachers, administration and I upload it on my school’s website. This way everyone is informed of where I should be and it promotes my program in a positive light showing all the areas of where I spend my time. Read more on setting up a calendar in my post, The Simply Way to Schedule Counseling Lessons and score a FREE Calendar Template! Spending time directly with kids and less time on organizing materials is another way to become more effective. Set up a way that works for you and stick with it. Each year spend a few minutes perfecting your system and it will become easier each year. Organizing my lessons by color and grade level helps me keep it together. Each lesson is different for every grade, therefore, I can keep doing them each year (if my needs assessment allows). I start by assigning each grade level a color. For example, Kindergarten is red and 1st grade is yellow. Once I have that done, I put all the materials I need for each lesson in the colored file folder and label it lesson one, lesson two, etc. I originally get the lesson topics based on my schools needs assessment and I plan out my calendar in sections. First Quarter is Academic Success, Second Quarter is Safety & Careers, Third Quarter is Social Skills, and Fourth Quarter is Self-Awareness. When my lessons are this organized, I don’t have to think about it anymore! It allows me to grab what I need, make copies for the week and go teach. Being effective with this part of my job allows me to spend time where it really counts… directly with kids! Starting each day with a clean slate feels so good. But, sometimes, it is nearly impossible. 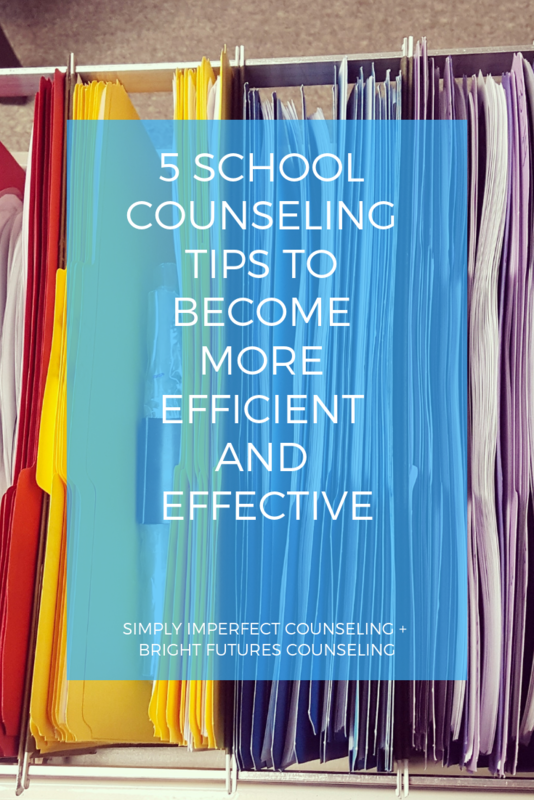 As school counselors we often have a to-do list a mile long. Try to be proactive and set yourself up for success before you leave. That doesn’t mean you have to finish your list every night. But, have things cleaned up, laid out and ready for the next day! Just like the example of laying out your workout clothes, if you lay out what you need for each day and prepare yourself, you can be more efficient. What kinds of things do you have in place to stay organized and become more efficient?